Before we get to this bonus episode, a quick offer. If you happen to be a member of 24-Hour Fitness, the national gym chain, and you want to be part of a behavioral-science experiment, go to 24go.co/freak. You can enroll in a program called StepUp, which was created by our friends at Behavior Change for Good, a group of scientists who are running big experiments to help people achieve better outcomes in health, education and personal finance. You’ve heard about their work in a couple previous episodes. One was called “How to Launch a Behavior-Change Revolution”; the other was “Could Solving This One Problem Solve All the Others?” The StepUp deadline is January 31st, so hurry! Now, on with our show. This is a Freakonomics Radio extra: our full interview with the entrepreneur and Dallas Mavericks owner Mark Cuban, who’s been appearing in our “Hidden Side of Sports” series. Cuban has owned the Mavs since 2000, and he’s one of the investors regularly appearing on the reality TV show Shark Tank. He made his fortune in the late 1990’s, selling the streaming service Broadcast.com to Yahoo for $5.7 billion. Our conversation took place last summer, before the current N.B.A. season had began. LeBron James was still a free agent at the time. The Mavs had already drafted the Slovenian teenager Luka Doncic, who has been having an excellent rookie season, even though the Mavs are doing poorly overall. The conversation covers a lot of ground — including Cuban’s ambitions to own a baseball team and maybe, just maybe, run for President. You’ll hear a number of names that you may not be familiar with. Byron “Whizzer” White, for instance, was a great collegiate athlete who played three seasons in the N.F.L., twice leading the league in rushing, but left for law school and, ultimately, a seat on the U.S. Supreme Court. The “Rick” that Cuban mentions is Dallas Mavericks coach Rick Carlisle; Tim Donaghy is a former N.B.A. ref who pled guilty to betting on games he was involved in. If there’s anything else you don’t catch — well, that’s what Google is for. Thanks for listening. 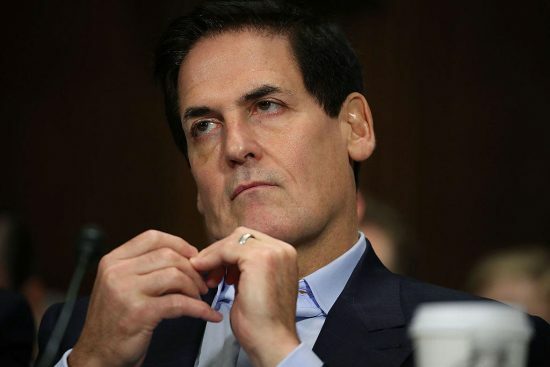 CUBAN: My name is Mark Cuban and you’re listening to Freakonomics Radio. DUBNER: Hey, this is Stephen Dubner. Hey Mark Cuban, how’s it going? CUBAN: Great, Stephen Dubner, how are you? DUBNER: Congratulations. Yeah, he looks amazing. CUBAN: We hope he is. DUBNER: So let me ask you this. You’re roughly 60 years old, you grew up in Pittsburgh, which is one of the best sports towns. I’m just curious, in a nutshell, how you think pro sports has changed since you were a kid. CUBAN: Oh my goodness. That’s a big question. It depends on which sport, it depends on what city. Depends on whose perspective. I think in a lot of ways it hasn’t changed but in a lot of ways depending on what city you’re in, your teams have come and gone, are better or worse. And it just depends on perspective. DUBNER: Okay, let’s pick a team. Let’s pick the Steelers of your childhood and my childhood. Guys like Rocky Bleier and Andy Russell, even Franco — well maybe not quite Franco, but these guys would typically work an off-season job, and they weren’t making money to retire on. And now, obviously, the economics are a lot different, but the economics are a lot different on the business side as well. There’s just been tremendous, tremendous, tremendous growth and I guess I’m curious — as sport has become such a massive and global business — whether you think that’s basically made the product, the games, better, worse, different. How so? CUBAN: I mean I think it’s made it better because it’s an incentive for more people to become professional athletes. For all the stories of athletes working in the summer there’s the Whizzer Whites of the world and other athletes who chose not to go into professional sports at all. And so now the money creates enough of incentive. But again, that— that’s just part of the equation. Now there’s other issues there’s CTE for hockey and football, there’s — soccer is much more—is a much bigger sport in the U.S. than it used to be when I was growing up. It wasn’t even a varsity sport when I was in high school. And so a lot of things have changed. DUBNER: You’re best known probably for two things: Shark Tank and owning the Dallas Mavericks. Can you just give us a quick catalog of your other sports business interests? CUBAN: Oh my goodness. Most of my other sports interests are driven through technology, whether it’s Synergy Sports which does cataloging and video of all things basketball. Sports Radar, which is an information service for sports. Unikrn, which is delivery for e-sports. It allows for tokenized betting for e-sports right now. What else? Axon, which does neural development so that athletes can improve their neurological responses to stimuli and their physical responses as a result. Another company that uses virtual reality and like a Wii-like technology to help kids and athletes and professionals improve their dribbling skills and other basketball skills. DUBNER: Now, I would say of everything that you just named there if you were to rewind the tape to 40 years ago or 50 years ago when you were a kid, most of those would have been somewhere between unimaginable and not feasible. I mean that— that’s one direction in which sport has just blown up in terms of technology. Again, do you see the technology and we hear all the time about how the data revolution is changing the way the game is played. I’m curious whether it’s really having as big an impact as we’d like to think or imagine. CUBAN: Oh yeah, absolutely. Analytics obviously has helped in terms of team strategy but that’s actually become a relatively efficient market because all teams are involved and they’re all hiring smart people to do mostly the same things. And then there’s bioanalytics, where we’re becoming smarter about the body, nutrition, sleep, genetics. There’s just so many elements involved with bio analytics that it’s a never ending improvement cycle. DUBNER: So, in terms of turnarounds, franchise turnarounds, your team, the Mavericks, have been one of the most drastic. When you came in, I guess the nine seasons before you arrived, the Mavs winning percentage is about 40 percent. CUBAN: Yeah, we were awful. DUBNER: And since you’ve been there, about 70 percent, so that’s really remarkable. So we could either say I mean if we’re going to try to draw a causal relationship, we could say either Mark Cuban is one of the best owners ever, or he was really lucky to intersect perfectly with Dirk Nowitzki’s career, or five, ten other things. Can you just talk about what you did that you think worked, and what are the other factors that led to that success? CUBAN: Well, hopefully the two aren’t mutually exclusive. I think sometimes when you’re dealt a good hand, not screwing it up is a talent. But I think what I did was try to change the culture. Because like any work environment, you can have really really talented people but if they don’t like coming to work, or they don’t like working together, then you’re not going to get optimal results. And so what I came in, the previous owner nickeled and dimed everything, didn’t recognize that the players were the key to the organization. We did things like spend more money on computer repair and training than we did on medical issues, and development for our players. And so I just changed that. I just flipped the script and said, look, my job is to provide the resources to put everybody in a position to succeed. And if I do that good things will happen. And so we had Dirk. We had Steve Nash. We had Michael Finley. The same three guys were awful the year before I got there. The day I bought the team, our record was 9 and 23, and we finished out the season, I think 31 and 19, and won 50 games the next season. So while I certainly didn’t hit any jumpers, I think I recognized that there was an opportunity to invest in some great players and make them better at what they do. DUBNER: What was the mental state of the organization in the building when you came in with that losing record that year? CUBAN: Get me out of here everybody — it was a way station if you couldn’t get a job somewhere else you came to the Mavericks. When players were traded here they just couldn’t wait to get out. DUBNER: Your last couple seasons, though, have been fairly stinky at least by Mavs standards, so much so that you got a high draft pick this year. So what happened? CUBAN: What happened is guys get older. Guys get injured, and so you play it out as long as you can, as best you can and we try to respond and rebuild as quickly as possible. And hopefully this summer with our draft picks and and anybody we sign in free agency, we’ll be able to do that and start fighting our way back. DUBNER: You’ve been fined a few times by the N.B.A., most recent one was 600k for talking about that it was essentially in the best interest in the team to lose to get a higher draft pick. I’m just curious. You’re worth about 4 billion from what I’ve seen. Do you care much — I mean is that strategic outspokenness? CUBAN: In that case it wasn’t. More often than not it was. In that particular case I was being interviewed by Julius Erving and I just fanboyed and said the wrong thing. Seriously. Julius Erving was my boyhood basketball hero. I mean yeah he was the one guy I looked up to, and it was the first time I’d met him. And to give you an idea of how much of a fanboy I am, of Julius Erving, when I was a kid, The Fish That Saved Pittsburgh, an old basketball movie was being filmed at the Civic Arena. And I took a bus down there just to see him just— just to be able to see Julius Erving. Not playing basketball, just to see him. And then when I first bought the Mavs, I was at an N.B.A. All-Star game, I think it was in Philly, and I took a picture with Dr. J. He didn’t know he was in the picture. It was me having someone take a picture with him in it, with me smiling. And then when he asked me to do his podcast it was just like yeah. And so I was trying to be too cool and tried to impress him, and when I start talking about being a player’s owner he said he would have liked to have played for me as an owner. Then I had to show off, and that’s when I said the wrong thing. DUBNER: What was it about Dr. J as a player that you loved so much? CUBAN: Oh, just his athleticism, his winning attitude, his uniqueness on the court and off. He had a certain style that he didn’t take any prisoners and he was who he was without regrets. And I always admire those qualities. DUBNER: And this was also the A.B.A., which was the upstart league. I sense that you’ve kind of identified with upstarts throughout your life? CUBAN: Yeah, I would I would say underdogs more than upstarts. Maybe they’re one and the same in a lot of instances. But it’s not like I expected all this to happen. And so every step of the way I would try to just keep on grinding and and try to accomplish what I could accomplish and go from there. DUBNER: I am curious who your favorite Steelers were. CUBAN: Oh Franco Harris, Mean Joe Greene, Jack Lambert. DUBNER: Any dark horses, any — any more obscure guys? DUBNER: Tunch Ilkin, sure, he’s still broadcasting for them. CUBAN: Oh is he really? Yeah. So Tunch came from Indiana State and we had a mutual friend and so when he came to the Steelers I would go hang out with him and some of the Steelers and, to tell you a quick story, one time we went out with Jack Lambert, Steve Courson, Tunch Ilkin, Lynn Swann to a place in Green Tree, Pennsylvania. Horrible snowy day. I had a nasty old 1977 Fiat X1-9 which is a tiny car. And they got up, left earlier before I did. I go out to find my car in the snow, and they literally had picked it up between them and carried it up and put it on a hill, so that I had to go and figure out how to get it through the snow down the hill back into the street. DUBNER: Alright. So you did not become a professional athlete yourself, but you went one better and became a billionaire. And the story for people who don’t know it, it reads like fiction. So can you just briefly tell us that story? CUBAN: I would tell you we started the streaming industry. There was a point in time in the early ’90s where the Internet was becoming functional, and one of my buddies from college was like we’ve got to be able to use all this new Internet stuff to be able listen to Indiana basketball. And so I was like okay, I’m a tech guy. Let me see if I can figure it out. And I had just sold a few years earlier my first company, which was a networking company, so I was familiar with the technology and had a little bit of money. And so I went to work. Bought a PC — a 90 megahertz Packard Bell, an ISDN line, and just started figuring out, and we created a website called AudioNet. Fast forward a few years we go public, it’s the biggest IPO in the history of the stock market. And what you probably don’t realize is we dominated all things audio and video on the Internet. There was nobody close. As dominant as YouTube is today, we were that dominant then. We had a unique opportunity that when we sold to Yahoo, if they would’ve kept on doing what we were doing, even after the the stock market bubble had burst, there would be no YouTube. There might not even be a Google. I mean they chose the direction, and they chose to de-invest when Google chose the opposite, to invest. And that changed the course of history for streaming. DUBNER: So that was nearly 20 years ago, that was ‘99, that you sold Broadcast.com to Yahoo. DUBNER: Can I ask you to speculate a little bit, maybe not looking 20 years forward but maybe five or ten? Big live sport events are in some ways keeping the legacy broadcast networks alive. They are one of the few destination points for watching TV these days. I’m really curious, the streaming companies and companies like Amazon that have streaming as well, they have so much money now that I’m guessing — I mean they could buy the leagues if they wanted to — So I’m really curious to know what you see the future of watching sports looks like. And will it be kind of, gradually changed so that we won’t even notice so much, or you think it will be radically different than now? CUBAN: I think it’ll be gradual but it’ll be different for a couple of different reasons. One, one of the reasons sports is still so prevalent on traditional television is it’s a destination. If you want to watch the Mavericks, if you want to watch the Pirates, if you want watch the Penguins, the Dallas Stars, whatever, you have to go to traditional TV, and that’s one of the keys to retaining the customers, the subscribers that they have. Particularly for older viewers, which leads to a big question that’ll drive some of this at some level. When people turn 40, 50, 60, do they start consuming more television or will millennials, as they age, stick to traditional digital over-the-top? That’s the unknown question because you still— for over-the-top, you still have to do work. You still have to choose from 20 apps, 30 apps which is more annoying than going through a DirecTV programming guide. And so those things have to improve dramatically, I think, before the older consumers switch from traditional television. All that said, one of the challenges for over-the-top is that there’s an unlimited number of choices. When you go on Charter, Comcast, DirecTV, AT&T, whatever, you’ve got 250, 300 choices maybe. And that might be daunting, but it’s still somewhat manageable. When you go online there’s a zillion choices. There’s no limit to the number of choices. You can spend a day in YouTube, so destination content is much rarer. There aren’t a lot of hits online, and even when you see YouTube stars or Instagram stars, they have to create content every single day, and the same applies to Twitch. Ninja has got to be playing — there’s a thing from Ninja, the guy who’s the Fortnite superstar, that when he didn’t broadcast one day, he lost 40,000 subscribers. So it’s a whole different beast. And so over-the-top, when it comes to sports, I think that the license value of the N.B.A., college sports et cetera is going to escalate significantly, because it’s harder to draw an audience over-the-top. And for the reason you mentioned, right now the market caps are bigger than the top — the FANGS, the top five— four, five or six different online media companies just dwarfs traditional media. So I think a lot’s going to change. Then you add the impact of 5G. And so 5G smaller cells but much higher bandwidth which means you can broadcast different types of things at higher bit rates and it also may lead to people cutting the broadband cord. So all that money you paid for your Internet subscription, you may be paying 50 bucks, 75, a hundred bucks a month for broadband. That might go away and the same subscription you use for your phone, you might use for your broadband as well, which can in turn change how we consume content as well. DUBNER: Right. Let me ask you this. Let’s look at individual sports or leagues especially with the future of the way the material’s distributed, and the future of those games or leagues themselves. So let’s pretend that you have the choice of three stocks to buy, and I’m going to make you— I’m going to make you buy one, sell one, and hold one. And the three are going to be N.F.L., U.F.C., and we’ll say a basket of e-sports leagues or games, Overwatch. CUBAN: I’d take e-sports. Yeah if it’s against those three, I take— I buy e-sports, sell N.F.L. DUBNER: Right. Okay. And hold U.F.C. for now. Okay. Let’s get into both of those a little bit. First of all why sell N.F.L.? CUBAN: I just think CTE creates a problem so participation has been dropping the last few years, and will continue to drop more. And I have an 8-year-old son there’s no way I’d let him play tackle football. My brother lets my nephew play high school football but he’s not that good. So it’s not like he’s got a future in football. DUBNER: Right. What about the political stuff that’s happening, mostly the anthem protests? Do you think that’s legitimately hurting football, or is that more of a sideshow? CUBAN: No that’s short term. that’s short term. CUBAN: A parent if you don’t want your son playing— daughter I guess, I don’t want to be gender-specific. But if you don’t want your child playing contact football, then you diminish the viewing in the house. It’s like, I don’t want my son to get excited about watching football. And in reality, it’s crazy because, “Hey let’s watch a Cowboys game, let’s watch a Steeler game.” When I was growing up, it was a certainty. That’s what you did. Now he’d much rather play Fortnite or do other things than watch football. DUBNER: It was hurt for a lot of different reasons obviously, but — But what do you think U.F.C., the league, has done or the sport has done that the N.F.L. maybe isn’t doing as well? CUBAN: I think it’s just different, because it’s individuals and individuals can make their own choices. You don’t need a lot of participants. In any given U.F.C. fight there’s 10 matches, 20 guys, and so you don’t need the number of participants that you do obviously for football, where there’s 53 guys on a team, and 32 teams and then college football, high school football, et cetera. DUBNER: Right. OK. And you’re buying e-sports. So say why and especially explain to people who can’t get their mind around it at all. What is the appeal of watching— I mean especially Dallas where you are has become really a hotbed. CUBAN: It’s become a hub. Yeah. DUBNER: Yeah, I mean there’s arenas, stadiums being built and so on. So why do 20, 50,000 people want to go to a stadium to watch other people play video games? CUBAN: Because once you understand the game it’s like— once you play, you understand the nuances of the game and it’s aspirational and educational. And so if you like to play League of Legends, it’s hard. But one of the ways to get better at League of Legends is to watch other people play. And to learn the nuances and to learn the strategies, particularly given that they change the rules every 90 or 120 days. And so because of that, the e-sports teams have got to practice hours and hours and hours a day. So it takes a real skill, it’s a real sport, and if you like it, watching it is entertaining, educational, aspirational. And you also have to realize that anybody in front of a PS2, Xbox, PC watching these kids that play, in their mind — just like maybe we watched sports growing up — it’s like hey if they can do it I can do it. And so that’s the aspirational part of it as well. There’s no physical hurdles. You can be 4-foot-1 or 7-foot-1, and if you’ve got the hand eye coordination and the the brain processing speed, anything’s possible. You could do it too. DUBNER: One of the investments you mentioned, Unikrn, is a company that facilitates betting on e-sports. Can you just tell us a little bit about how that’ll work and whether gambling on e-sports is maybe a little bit more susceptible to match fixing than other sports, or not necessarily. DUBNER: Yeah and how does it work? I mean what kind of access will we have to what kind of bets? CUBAN: Well you realize, gambling is legal in 118 countries. And so right now for e-sports in those countries, you can just go bet on who wins and different prop bets just like you could any other sports. DUBNER: Let me ask you about American pro sports leagues. So you’re an N.B.A. owner. I don’t know too much about how “the league” works. I know a little bit more about the N.F.L., but in the N.F.L. the owners are essentially “the league.” Is it much different in the N.B.A. or is it pretty similar setup? CUBAN: No, not really. Yeah, not really at all. I think the biggest difference between the N.F.L. and the N.B.A. is the emphasis put on talent. In the N.F.L., they sell the N.F.L. In the N.B.A., we sell the talent, the players. We promote the players and they promote themselves because it’s mutually beneficial. I think with the exception of just a few stars— this is just my opinion — the N.F.L. appears to look at their players as being more fungible. There’s 53 of them. You’re going to rotate X number through every year, and honestly, if the entire Steelers team was in a mall or the entire Dallas Cowboys team was in a mall, maybe two or three of the players would get recognized and so — it’s a different world. DUBNER: That’s partly cause they’re helmeted, yeah? But it’s more than that. Right? CUBAN: It’s not — Yeah, it’s not just cause they’re helmeted. DUBNER: Okay. So given that the leagues operate — there’s obviously a lot of differences, roster size, number of games, et cetera, et cetera, et cetera. But let’s assume that for the sake of argument that all four major sports leagues in America are pretty similar in that they have — it’s a membership and once you’re in you’re in. And it’s pretty hard to lose money as a professional sports team because of the way revenues are divided. CUBAN: No, that’s not true at all. No, that is not true at all. Oh, hell no. DUBNER: Give me an example. CUBAN: I can’t throw out names, but yeah. DUBNER: Well how many N.B.A. teams in a given year are going to lose money? CUBAN: More than you think. DUBNER: So even with the revenue-sharing, with all the broadcast and other monies distributed evenly, and with a salary cap that guarantees that you don’t have to overspend a certain amount, you’re saying that— How do you lose money? Is it by lacking gate revenue? CUBAN: Yeah. Lacking revenue period. Just like any business. DUBNER: Right. But what’s the major variable, is it gate revenue or is it broadcast revenue? CUBAN: Gate, broadcast, players, all the obvious things. DUBNER: Right. Okay. So that said, leagues in major American pro sports are more protected than let’s say European soccer, right? CUBAN: Right, cause there’s no relegation, yeah. DUBNER: Exactly. Do you think—and it’s always funny because our capitalism is more cutthroat than theirs. They’re a little bit more socialist but we have the slightly more socialist setup. Which do you prefer, I guess I’d like to know. CUBAN: Well it depends where you are, right? If you already have a significant brand like Real Madrid — you, because you can spend more money than everybody else. And they put some limits on how much money teams can lose and how much debt they can have and that’s impacted things. But if you’re on the bottom and you can buy a team inexpensively and you think you’ve got a secret formula that can get you into the Premier League et cetera. Then that’s the position you want to be in if you’re on the top and there’s nothing that’s going to impact your revenues and you’re a global brand and you generate licensing and other incomes globally. You want to be at the top. The N.B.A., we’re a global brand, but the Dallas Mavericks get one thirtieth of anything sold, whether it’s in China or Germany or San Francisco. We don’t control the generation of revenues for ourselves except in our local markets. DUBNER: In what league in U.S. sports do you think players, the athletes, have the most leverage and the least leverage? CUBAN: I’d say the N.B.A. and the N.F.L. DUBNER: N.B.A. is most and N.F.L. is least? DUBNER: And does that have to do with roster size primarily, or does it go beyond that? CUBAN: Roster size, injury, contact sports. The number of college football teams providing talent. The fact that they go four years so you get to see— or most of them go four years, so it’s easier to evaluate talent. DUBNER: Right. Speaking of college football, what’s your overall view of the N.C.A.A.? CUBAN: I think it’s worthless. DUBNER: Yeah. Obviously there’s a lot of incentive to keep it as it is. A lot of people are benefiting, although you could easily argue that the one set of people who should be benefiting, the people who are actually providing the physical labor are are not benefiting very much. If you could blow it up entirely, what would you do? Would you have football attached to college at all, would you make it some sort of a D-league instead? CUBAN: Yeah, I don’t mind having it attached to college, but I would make it an independent entity, so that it would operate independently. Look, if I wanted to create a League of Legends team, that’s not N.C.A.A. bound, so I can pay players if I choose or incent them. I can let them have a job, right? Let them go get a job, let them practice as much as they need to. Much as I could if I wanted to create a band and I went to Indiana University, my alma mater, and found— which has a great music school — and found the best musicians for the band I want to put together, I can pay them and they can stay in school. They can practice together as much as they want. That’s the hypocrisy. If you want to be a professional athlete, you can’t practice your craft as much as you would like. There’s limits to coaching and playing with your teammates. There’s limits on jobs you can take. There’s there’s so many different things that are bound in stone that it just doesn’t make sense. And so there’s reasons why they evolved to where they are, but it’s time to take a whole different look. DUBNER: Yeah. Do you know Domonique Foxworth? CUBAN: No, I do not. DUBNER: He was the number two of the N.B.A. Players Association for a while. He was the president of the N.F.L. Players Association. He was a player, he was a cornerback, played for I guess Denver, Atlanta, then Baltimore. So he’s an interesting guy. A career cut short by injury, but he cashed out because he had insurance. And now he’s kind of mid-life, early 30s, and he’s looking back and trying to figure out how to help the next generation of athlete do better. He told us that he thinks it would be in the best interest of players to dissolve the unions, the N.F.L.P.A., the N.B.A. Players Association, because that would put the leagues in violation of labor laws, and it would give players the power to negotiate better deals and to make more money. CUBAN: Every time there’s a lock — Look I’m not a C.B.A. expert, I can’t get into details. The N.F.L., there’s a long history of labor unrest and the first thing they do is dissolve the union. DUBNER: Well, let’s say that for a minute you’re not on the ownership side at all and that you’re either with your— let’s say you run the biggest sports agency in the country, or maybe are associated with players in some way. CUBAN: Let me slow you down right there because if I do anything relative to the C.B.A., I’ll get fined again. And while I like you, it’s not strategic right now. DUBNER: I can accept that. DUBNER: Let me ask you this: big development from the Supreme Court not so long ago about sports gambling. I would assume that really changes the valuation of every professional or even semi-professional sports franchise. Can you talk about how that’s going to affect you? CUBAN: Yeah I think it’ll lead to our franchise valuations doubling, literally, because there’s a lot more reasons for people to pay attention, a lot more reasons for people to watch. And that’s good for our bottom line. People will attend more and watch more hours of N.B.A. basketball. And same for all professional sports. DUBNER: All right, I got a quiz for you, or a riddle. I know you’re a very smart guy, I won’t be surprised if you get this right. Home field advantage exists in every sport all over the world. What would you say is the primary driver of home-field advantage according to academics who’ve studied this? CUBAN: My guess would — and it’s not home-court, home-ice advantage doesn’t necessarily hold true. Like in hockey, it doesn’t hold true. So, I would tell you probably the energy and — so there’s a couple of things. One, I know there are studies that say that the officials give benefit to home teams across all sports. People have tried to argue that that’s not the case. Whatever it is, it is. And then there’s the energy of a crowd. I mean, crowds do make players play harder. And then I’d also say there’s just the comfort of playing in a place that you’re used to shooting and playing in, hitting in, fielding in, et cetera. DUBNER: So what the academics argue is that it’s basically unconscious ref bias. That they’re not rooting for the home team, obviously, but that basically the crowd’s sentiment puts the refs unconsciously in that moment. CUBAN: I think Justin Wolfers wrote that. DUBNER: Justin wrote about race actually. Most of the studies about home field advantage come from soccer where there are some nice little instrumental variables that you can use to determine. CUBAN: And plus, depending on the level of soccer, where you’re playing — Yeah there’s concern for their lives. DUBNER: Yeah, exactly. Exactly. Yeah like one of the best pieces of evidence came from measuring soccer played in stadiums where there was a running track around the field. So the refs are literally 20 yards further from the crowd, and there the home field advantage is much less so. But that said, you are probably most famous, as an owner, for — I don’t know if you want to call it working the refs, but communicating with the refs. Just talk about that, how it evolved and how successful you think it is. CUBAN: It’s funny. Everybody’s wired differently and when I play basketball — and by the way I just got done playing basketball and I’ve just had a Diet Coke up against my Achilles. So, I’ve been a basketball junkie my entire life. Everybody’s got something and for whatever reason when I got to the Mavs, I just looked at the officiating, and it just drove me nuts because my attitude has always been that the three officials in basketball, no matter what the level, have more impact than 80 percent of the players on the court. And that’s why it’s always driven me crazy. And when I first got in and started doing my homework, one of the things that was conventional wisdom is that games weren’t officiated the same in the first minute as they were in the last minute, and that just drove me nuts. And the more I got to know, the more I got to learn. Then I started to understand how officials at all levels manage games and deal with certain issues. And it wasn’t always about making the right call throughout the game. And so that just ticked me off. And that just led to everything else. And so was it worth it? Yeah, I think it has been, because I can tell you that things have changed dramatically. At various times they’ve changed dramatically for the better. At various times personnel changed and it got worse. So we’ll see what happens this season. DUBNER: Do you think that your input on that has changed the way N.B.A. games are refereed now? At least more consistency? CUBAN: I don’t know if there’s more consistency, but yeah. DUBNER: What are the channels by which it’s worked? Have there been actual committees where you sit down and say, listen this is plainly going on and it’s not right, not fair, not transparent? CUBAN: No, it’s not even like that. It’s not like I come in and say this ref is biased or this guy’s got a problem. Couple of times I’ve done that, and it’s been investigated and it’s been fixed. And it’s not like Tim Donaghy, it’s just little marginal things. But in any event, what has changed in my— The thing that I have always harped on the most is from all my experience in business, you always want to get the best possible manager. And where I’ve seen a lot of companies make mistakes is they’ll take their best salesperson and make them a sales manager. Well, just cause you’re a good salesperson doesn’t make you a good sales manager. And so using that analogy, just because you were a good referee or just cause you were good in management somewhere in the N.B.A., doesn’t mean you’re the best person to be in charge of the officiating group. And that’s been my biggest battle, that they promote people not because they were the best for the job but because they were there. Or they promoted refs into positions of authority, not because they were great managers or not because they could get great results, but because they used to be good refs, and those guys wanted to keep on working. And so that’s where I had the greatest amount of problem and that’s where I think I’ve had the greatest impact. DUBNER: Gotcha. There’s another piece of research that argues that a lot of N.B.A. coaches are bad strategically when it comes to sitting players in foul trouble. That if a player is good enough to sit because you’re worried about losing him then is his value is actually greater by playing. I’m curious if you have any thoughts on that and if you’ve ever talked to your coaches about that. CUBAN: No, I agree. Because — going back to the refs — even the refs know how many fouls a guy has. And so they understand that if it’s a toss-up call and it’s a gray area call, they’re probably not going to call it. And players are smart enough to adjust. Now on the flip side when you know a great player has three fouls in the first quarter, you’re going to go at him and try to get that fourth foul, because there is a point of diminishing returns. And so typically if it’s two fouls, I’m fine if Rick keeps them in, and Rick’s gotten to that point. If it’s again a qualified depending on the opponent, right? Because the value of that player is relative to the time, the score, and the opponent. And so if the numbers say keep him in, I’m fine with keeping him in. DUBNER: When are you finally going to buy a Major League Baseball team? CUBAN: Never. Oh, well two things happened. One, they didn’t want me in. And two I had — my kids got older and they’re too much fun. 162 games, my wife would divorce me. DUBNER: Why didn’t baseball want you in? CUBAN: Because they knew I’d try to change things. I just did an interview with C.C. Sabathia and he was like “What would you do differently?” One I would teach all our guys to bat flip, every time they hit a home run, because you got to just change things up. These unwritten rules are ridiculous and the fans pay the bills, you gotta give them a reason to come. Two, I’d push for the designated hitter in both leagues so that pitchers in between innings can go right to the bullpen and warm up or do whatever they needed to. And that way when you come back on the field, you don’t throw any warmup pitches, you go right into pitching and there’s no throwing the ball around the infield and the outfield. You just go right in. The breaks aren’t the breaks, and you go right up to bat and you reduce an hour off the game. DUBNER: It is pretty weird. It would be like in the N.B.A. between every dead ball there’s like lay up practice again. CUBAN: Yeah, exactly you get to get shots up and everything to get your rhythm. And so there’s so many ways you can speed up the game. And I would have been pushing for them and talking about them and they didn’t want to see that. DUBNER: Yeah. What would you say have been your most significant changes to the way basketball is played since you’ve owned the team? CUBAN: Oh, little things. Things like the Clear Path Rule. I changed it because I showed them the math was wrong. That it used to be one shot and the ball, I changed it to two shots and the ball. Different replay things. Now, with the latest collective bargaining agreement, there’s a thing called the cap-room exception. So it used to be when a team had cap room you just had your cap room. Now there’s a $4.4 million exception that I pushed to get through in our collective bargaining agreement in 2011. And so that’s been a big change, and I’m sure there’s other things that’s just what comes to the top of my head. DUBNER: The effect of that exception is what then? CUBAN: So, if the Mavericks have $25 million in cap room this year and we use that cap room to sign three players and fully use it, we still have one exception where we can sign one or more players for up to $4.4 million dollars. And the logic was you want to incent teams to have cap room and to try to improve their teams, and one way to improve the incentive was to create this cap room exception. DUBNER: Right. All right, last question. Where is LeBron going? CUBAN: I don’t know and I can’t comment on other teams’ players. DUBNER: Dallas is not a team I’ve heard mentioned at all. Should they be? CUBAN: Who knows. Who knows. Like I said, you’re— I’m not ready to get fined again. DUBNER: Basically I’m no Dr. J. I’ve learned my lesson I stand down. CUBAN: I would never say that. DUBNER: That said, I very much enjoyed it and I really appreciate your time and I wish you the best of luck this season. DUBNER: Hey, you going to run for some office at some point? CUBAN: Yeah, I’m going to run to the bathroom right now. So I don’t know, we’ll see what happens in the midterms. CUBAN: Could I do the job? Yeah. Would I enjoy it, that’s hard to say. The challenge isn’t doing the job, it’s the process to get there. The definition of poor parenting is having kids eight, 11, and 14 and running for the presidency. CUBAN: No, I’m not a pimp. When it comes to my kids, no. It would be the exact opposite. DUBNER: All right, well whatever you do, I wish you continued huge success and I thank you very much for the time. CUBAN: Thanks I enjoyed the interview. Thanks to Mark Cuban for the conversation. You can hear Cuban and many others in our “Hidden Side of Sports” series. Freakonomics Radio is produced by Stitcher and Dubner Productions. Our “Hidden Side of Sports” series was produced by Anders Kelto and Derek John, with help from Alvin Melathe, Matt Stroup, and Harry Huggins. Our staff includes Alison Craiglow, Greg Rippin, and Zack Lapinski. The music you hear throughout our episodes was composed by Luis Guerra. Our show can also be heard on NPR stations across the country — check your local station for the schedule — as well as on SiriusXM, Spotify, and even your better airlines! « Previous PostHow Does Creativity Happen?